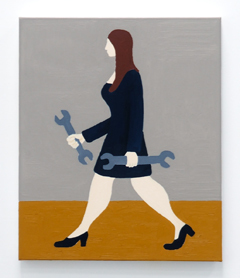 From September 7 to January 27, 2018, Galerie m Bochum is showing the new painting series by the Berlin-based artist Antje Dorn (b. 1964, Aachen) in the exhibition “Passage.” Executed between 2015 and 2017, the 45 oil paintings in varying formats all depict people walking, just as they can be seen doing daily in cities everywhere. Antje Dorn has devoted her series “Passage” to the most matter-of-fact way in which people move from one place to another. Paradoxically, however, the character of the paintings with their firm, concentrated brushstrokes and carefully demarcated and composed monochromatic surfaces remains calm and static. The images display Dorn’s signature formal language, consisting of simplified figures furnished with individual attributes and yet rendered as prototypes. Arranged into a frieze, 32 small pictures each show one or two individuals in profile as they stride along. Faces are depicted summarily, without individual traits. 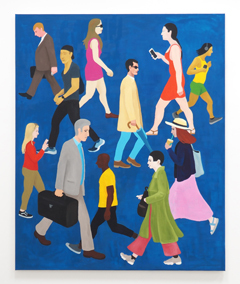 Dorn has divided the backgrounds of the pictures into two parts to imply a horizon line and thus a minimal impression of space, while focusing all attention on the walkers, who differ in age, gender, skin color, body type, and posture. The clothing and the selected accessories indicate an urban context and define the different types. And it is in these details that the renderings are most finely drawn. From these scant clues, we are able to develop associations about the nature and circumstances of the pedestrians we see here.